Friday night marked The Gaslight Anthem’s first Chicago headlining show. The band has been steadily winning over fans with constant touring and growing radio play. The group has rolled through Chicago opening for such successful acts as Rise Against, The Bouncing Souls, and The Loved Ones. Whose Drought Ends First- Cubs, Hawks, or Northwestern? Being a fan of Chicago sports can sometimes be as character building as walking outside for long distances in January. With Northwestern’s tournament bubble officially bursting last weekend, baseball getting ready to kick off, and the NHL playoffs commencing the week after, it’s a fine time to revisit the long-suffering dry spells that are Chicago’s very own. Upscale tends to be the trend in sports bars these days. Or at least the hope is to attract a more sophisticated and trendy crowd that would typically choose a hipper environment to spend their Thursday, Friday or Saturday nights. The new River North sports bar, Bull and Bear, not only lures the hipsters, but attracts businessmen and women during the lunch hour. The name Bull and Bear obviously recognizes two of Chicago’s major sports teams, but also refers to the financial world and appeals to the CBOT crowd. The restaurant has a nice layout and designs, but can get a little too close for comfort when crowded. After talking with a few friends about the menu, I wanted to see if their food matched the upscale vibe. Well, let’s just say that it didn’t measure up. The Bull and Bear menu has a ton of starters, salads, main courses, sides and short order options. There are a plethera of burgers and sandwiches to choose from as well as a few non bar food entrees. The “Onion Tower” and “Sweet Potato Fries” were typical. Nothing great, but nothing bad about either dish. The “Lobster Bisque” was deemed to be a signature item and would have been if it wasn’t served luke warm. The “Double Cut Grilled Pork Chop” was a little dry and didn’t live up to the waitresses billing, but my dining guest really enjoyed his “Pulled Hammy” pork sliders. We were graciously served with a sampling of all of their desserts, which consisted of a chocolate chip cookie draped in vanilla ice cream, cinnamon doughnut holes with three different dipping sauces, peanut butter bread pudding, and a “Thrilla in Vanilla” shake with Filandia Vodka and Godiva Dark Vanilla Royale. They were all savory, but I wouldn’t necessarily have paired peanut butter and bread pudding together. The service started off sketchy, due to a mishap with my reservation, but the owner and waitress attempted to make up for it. Don’t expect upscale service during crowded nights though, because it is still, however, a sports bar. A unique feature to Bull and Bear are their 5 premiere booths with Personal Table Taps. Each booth has two taps (1 domestic, 1 import) that dispenses beer, which is recorded on a meter at the table. The goal is to allow guests to pay-as-they-pour and enjoy a no-wait standard of service. This feature should be a big hit for beer lovers. Bull and Bear has only been open for about 3 weeks, so they may still be working out the kinks. Although they didn’t meet my dining experience expectations for what they deem as an “exclusive luxury sports bar”, I may give them another shot once the madd rush dies down. Bull and Bear is located 431 N. Wells St. For more information log onto www.bullbearbar.com. Also watch Fete Select TV on www.efete.net to check out the newest and hottest restaurants in Chicago. My friend Todd looked up from his beer and stared at the TV. The Dodger bench had emptied and the entire team was celebrating on the field. Joyous fans celebrated in the stands, while shots of dejected Cubs fans and players peppered the broadcast. “Why would anyone want to be a fan of this team?” he asked. Even the faith of the most obsessive fans can be shaken after a 100 year drought. So for all my fellow Cubs fans out there, this song’s for you. It’s by the late Steve Goodman, a great American singer/songwriter and, just like you and me, a true, Cubbie blue, Cubs fan. 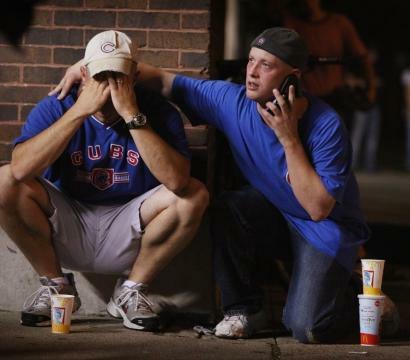 I’m sure you’ll agree this pretty much sums up what being a Cubs fan is all about. Click here to check it out.